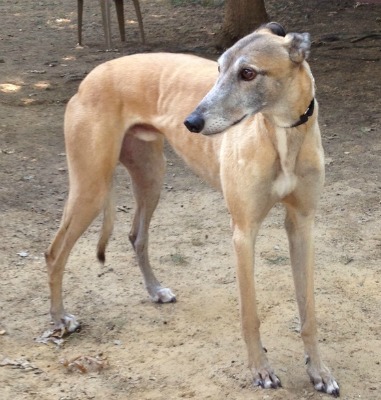 Indy is a 6½-year-old fawn male born February 2007 and is the J pup. His registration ear is not legible. His coloring is striking with the fawn and a darker face and tail. Indy was found running down Highway 259 near Idabell, OK, with a nylon rope tied around his neck that he had obviously chewed in half. An animal loving woman and her son braved the traffic dodging many semi trucks to save Indy. Her son finally captured him, and they took him to their home in east Texas. He was thin and had many cuts and scrapes, especially on his pads. They nursed him until his wounds had healed, and he had gained some weight. 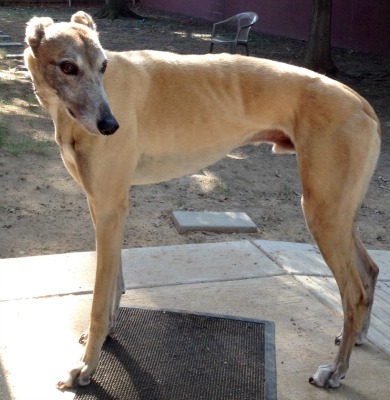 This kind lady then contacted GALT, and he joined the GALT family on August 2, 2013. Indy has passed a cat test with flying colors.